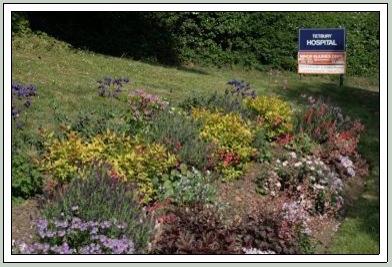 In January 2006, the Tetbury in Bloom Team started work on the Hospital bed. Situated on quite a steep slope under a tree, we decided to move its location further down the slope and change the shape from a semi circle to a long lozenge shape. Once the bed was ready to plant the theme ‘Soft & Fluffy’ was chosen using a calming colour scheme of pink, mauve & white. Sustainable plants included French lavenders, aquilegias, cistus, heucheras and silver leafed salix enhanced with pink and white cosmos with its soft feathery foliage, pink and white bellis and pink begonias provided all summer colour. 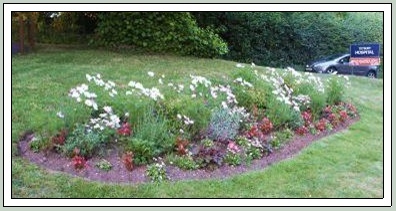 In 2007 the ‘soft & fluffy’ theme was not so apparent but more perennials including white penstemon, pink and mauve linaria together with pink marguerites, begonias and antirrhinums were planted. In 2008 the bed changed its identity further to a more spiky and structured look with the introduction of the kniphofia “Tetbury Torch” which was developed at our local Close Nursery. 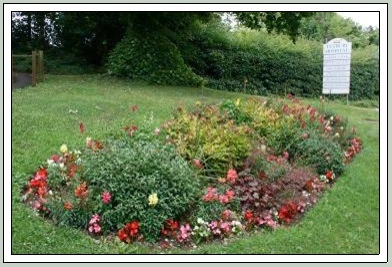 Despite the changes we made, the bed still failed to achieve that ‘WOW’ factor that so many of the other beds in the town have developed. We therefore enlarged the back of the bed to make it a softened triangular shape and introduced yellow choisya and golden euonymus which have been so successful in the Braybrooke Close bed. 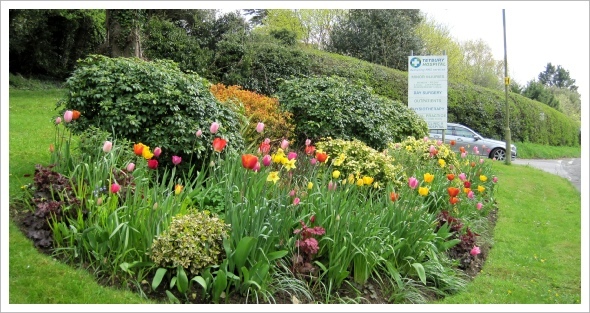 In Autumn 2012 we added several hundred crocus bulbs with the intention of extending the spring display of tulips and daffodils. This worked very well. In 2013 we changed the shape of the bed at the Malmesbury end so when you travel along Newnton Road from Malmesbury into Tetbury you have a wider view of the bed. That has worked very successfully.